The flood of migrants trying to cross the sea has reached new crisis levels since Friday. EVERY EU NATION needs to take its fair share of migrants to stop the Mediterranean becoming “Europe’s graveyard”, according to one Fine Gael MEP. Some 5,000 migrants have been rescued from the sea since Friday amid the ongoing crisis of refugees fleeing war-torn Syria for Europe. Fine Gael MEP Deirdre Clune said recent agreements among EU leaders hadn’t been enough to stem the flow and Italy, the main destination for the migrants, shouldn’t bear the burden alone. “It is clear that we need immediate EU action which is based on each country in the EU taking in its fair share of migrants,” she said. “We must show humanity and help those who are desperate to escape the ongoing conflicts in countries like Syria, Libya and other countries in Africa. Clune’s comments came as two of the EU’s most powerful members, France and Germany, called for a rethink on existing plans to admit asylum seekers who landed on European shores. Last week the European Commission asked member states to take a combined 20,000 refugees from Syria who were yet to set foot in Europe and another 40,000 landed in Italy and Greece. Ireland has already agreed to take an extra 300 migrants – up from an earlier figure of 220. But France and Germany said European countries at the initial point of entry first needed to take “all the financial and legal measures possible to boost surveillance of the external borders”. Only those “in obvious need of protection” would be resettled immediately, while “irregular migrants” would be sent back to their countries of origin. Forex, the European Union’s border agency, yesterday said more than 5,000 migrants had been rescued from the Mediterranean since Friday, while the number arriving in Italy has topped 45,000 so far this year. Meanwhile, the International Organization for Migration has reported almost 1,800 men, women and children have either died or disappeared making the journey. That includes the 800 people who died in April when a migrant-laden trawler capsized off the coast of Libya. 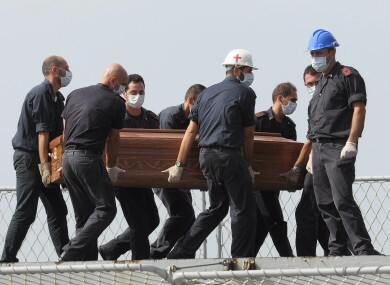 Email “'The Mediterranean will become Europe's graveyard'”. Feedback on “'The Mediterranean will become Europe's graveyard'”.